There are filters that can correct daylight color temperature film to indoor color temperature ranges and vice versa. There are Neutral Density filters (ND) of varying amounts that simply act as sunglasses for the lens to cut down the incoming light by a predictable amount. 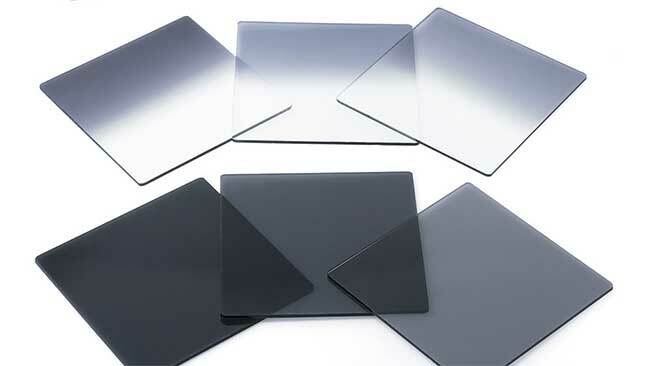 There are Gradient Filters that have partial coatings of either neutral desity tinting, color tints or correcting tints that allow the operator to position the gradient in front of the lens for controlling only portions of the composed frame. There are also Polarizer Filters that will alter the way reflected and refracted light enter the camera lens. This allows the operator to darken the sky without affecting forground elements. You can also reduce or eliminate reflections in windows and water. There are also a wide variety of camera filters that can do everything from tint your scene with an overall color, to softening the look with a mesh or blur treatment, to blurring only particular areas of the frame to control what the viewers eye is drawn to within the frame.